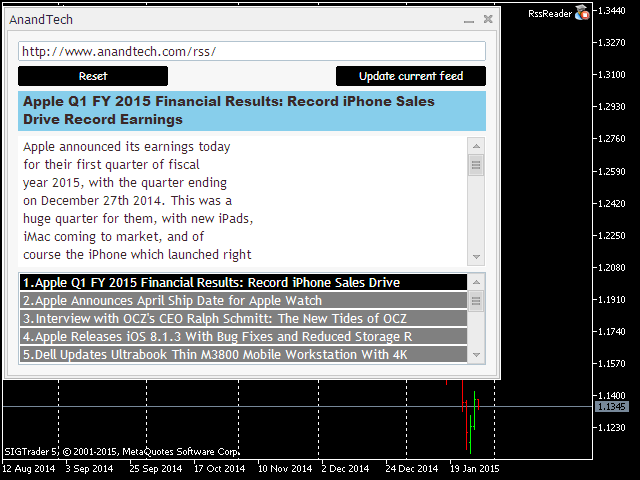 Rss Reader Mt5 is a completely interactive application for displaying RSS feeds on a chart window. The application has no input parameters at all. While using this program, one will be able to view not only the title of feed content but also the summary that accompanies it. When the Expert Advisor is loaded on to a chart, an empty application dialogue is displayed. 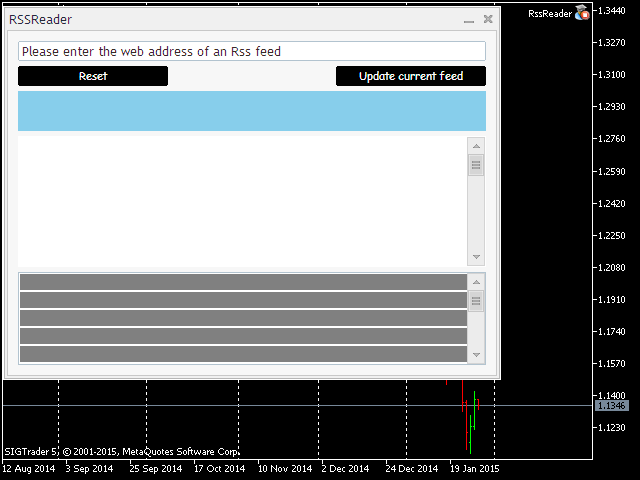 The input area has the caption "Please enter the web address of an RSS feed". It is here that you enter the desired URL and press Enter. First enable web requests by checking "Allow Web Requests for the listed URL" check box in the settings window found under the Options command of the Tools menu. Remember that all URLs must first be entered here for the application to work. Once the feed has been loaded, the scrollable list at the bottom is filled with the content titles of the feed. Clicking any of the list items causes the summary of the content to appear above the list. Sometimes, the text in the list appears cut off, do not worry. When the list item is clicked, the title is clearly shown in the blue area above the summary of the content. If a feed cannot be loaded, an error message is displayed. First, check your Internet connection, and then make sure the URL has been entered in the terminal settings. All error messages are displayed above the list section. If you enter an URL that does not point to an RSS feed, an error is triggered. The Reset button can be used to refresh the application dialogue, this returns the dialogue to its original state when first attached to the chart. The Update current feed button checks for updates to a currently loaded feed. The application dialogue can be dragged to any location on the chart. It can also be minimized and maximized. To remove the app from the chart, simply click the close button (X). Do not change the period of the chart whilst the Rss Reader program is running, first close the application and then reinitialize it when you have changed the period. For some RSS feeds, unrecognizable characters may appear in the text. The app is still in development. Please give feedback on your experiences with it.